Some days I just need deeply fudgy chocolate treat. Throw in some nuts and caramel and I am in heaven! 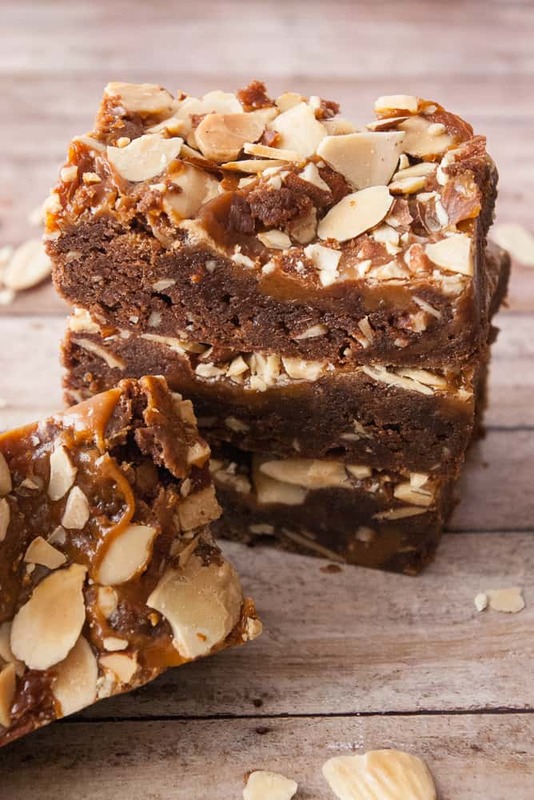 These Caramel Fudge Nut Brownies are my new happy place. Made from scratch and still quick and easy to prepare! I want to say that these are great to share and they are, but you really are going to want to keep them all to yourself. Trust me. So if you are all about deliciously indulgent desserts you will definitely want to try this recipe out! Preheat your oven to 350 degrees. Spray an 8×8 baking dish generously with non-stick pan spray. 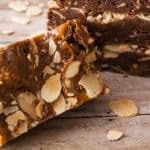 Prepare the caramel fudge nut brownie base as instructed in the recipe. Press into the bottom of the baking dish. Keep in mind that this batter is really thick and will take a little bit of elbow grease to spread it into the bottom of the baking dish. Melt the caramel bits and whisk in the heavy cream. Once smooth, pour over the brownie base. 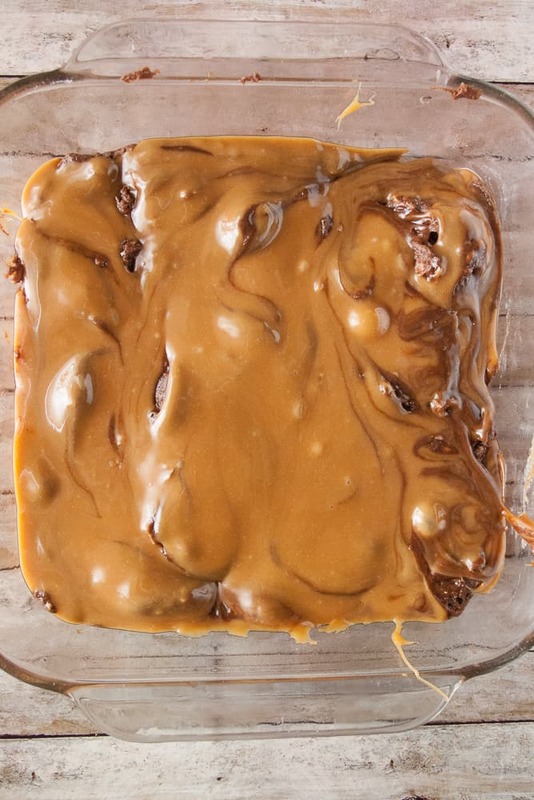 Use a butter knife to swirl the caramel through the brownies. Sprinkle with almond slivers! Bake for 30 minutes in a preheated oven. Cool completely before cutting and serving. At first I was a little worried because the sides seemed to be stuck to the baking dish, but once I got a sharp knife and loosen the edges it was totally fine. Preheat your oven to 350 degrees and generously spray an 8×8 baking dish with non-stick cooking spray. In a mixing bowl, cream the butter and sugar until fluffy. Add the egg yolks, vanilla, and milk. Add the salt and cocoa. Slightly crush 3/4 cup of the slivered almonds and mix them into the batter with the flour. 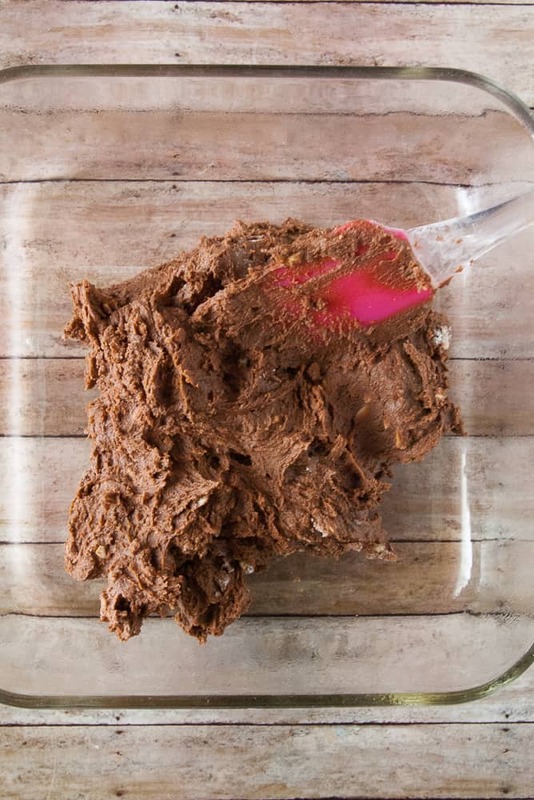 Press the brownie base into the prepared baking dish. 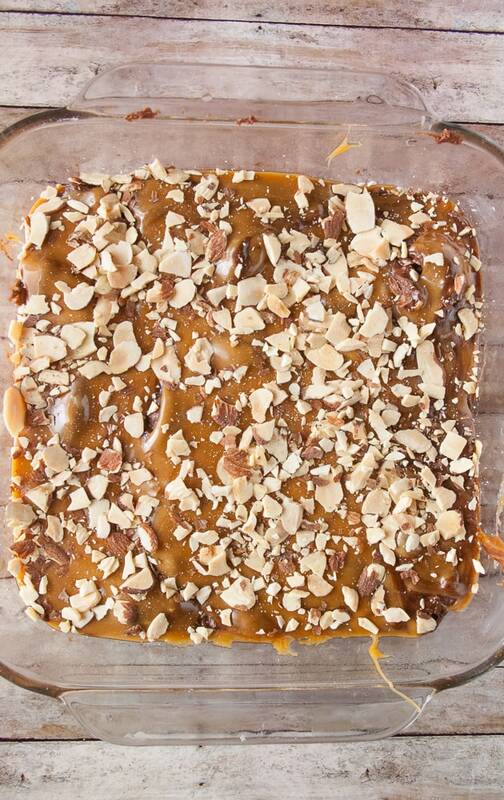 Melt the caramel bits in a double boiler or in the microwave. Whisk in the heavy cream. Pour over the brownie base and swirl with a butter knife. Sprinkle the remaining 3/4 cup of almond slivers over the top. Bake for 30 minutes in the preheated oven. Cool completely before cutting and serving. The edges may stick a little at first, but once you loosen them it will be fine.